Gazpacho has endless benefits for the body. This tomato-based recipe is ideal for a healthy and Mediterranean diet, as it has been shown to prevent colds, prevent high blood pressure, increase defenses or slow the aging of the skin thanks to its multiple vitamins . In addition, this drink is a great moisturizer that even helps to lose weight. These benefits are intensified or decreased depending on the quality of the products used in the recipe, and Bioterrane guarantees the best. The organic gazpacho of Bio Sol does not contain added water, only the own of the vegetables, nor gluten, being only composed by vegetables of own production and virgin olive oil, what makes its flavor is incomparable. In addition, Gazpacho Organic Gourmet Bioterraneo has the honor of being the gazpacho with more vegetables per liter of product of the world, since it contains 95.7% of vegetables. In addition, Bioterraneo has a system of pasteurization that allows the product to have an expiration date of 10 months, without having to keep it in cold, which is an added value to highlight. 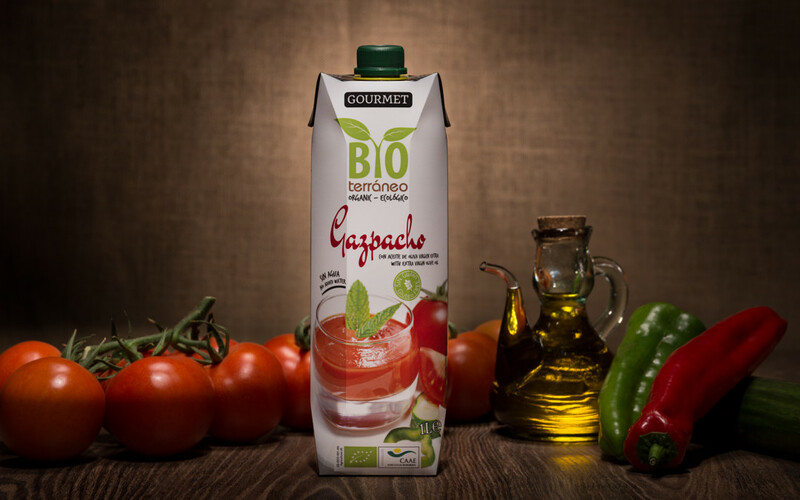 Gazpacho Organic Gourmet Bioterranoe is tasty, ecological and its quality standards are the highest in Spain and, therefore, worldwide, since our country is the number one in the manufacture of this traditional recipe. Are you going to resist trying it?